Today we examine a fun new device that combines two great modern conveniences: the Google Home smart voice assistant and a Full HD IPS Display viewing screen. This is a great combination for those that love the concept of the smart voice assistant but would like them to do more. 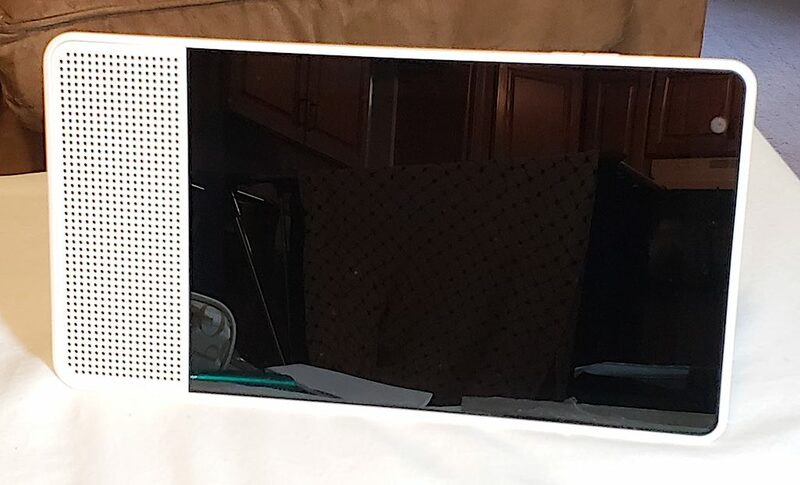 The device I’m referring to is called the Lenovo Smart Display, and it’s a brand new product that’s just hitting the market here in Canada now. Luckily, we got ahold of an early copy to thoroughly put to the test for the benefit of our readers. If you’ve been thinking of entering the smart voice assistant arena, you might want to hold off on making your move until you’ve learned all about this amazing new device, which you can do right here and now. Let’s begin. 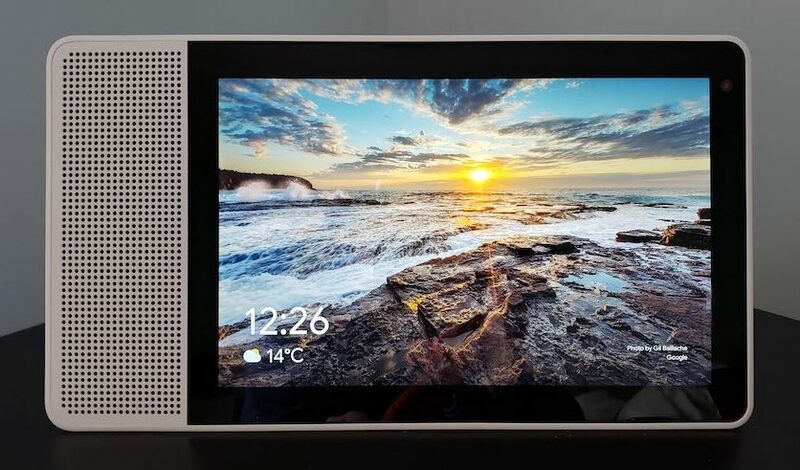 Editor’s Note: Please take note that the 8″ version of the Lenovo Smart Display (shown at the bottom of this review in its own special gallery) is the one that is now available at Best Buy. The review sample that we originally received was the 10″ model (the one with the bamboo backing, which is featured and discussed throughout this review), but only the 8″ model is available in Canada at this time. Aside from its slightly smaller screen size (1280 x 800 resolution) and different backing (see photos), the 8″ model is essentially the exact same product as the 10″ version, and most of the specs are exactly the same as well, such as its 10W full-range speaker. 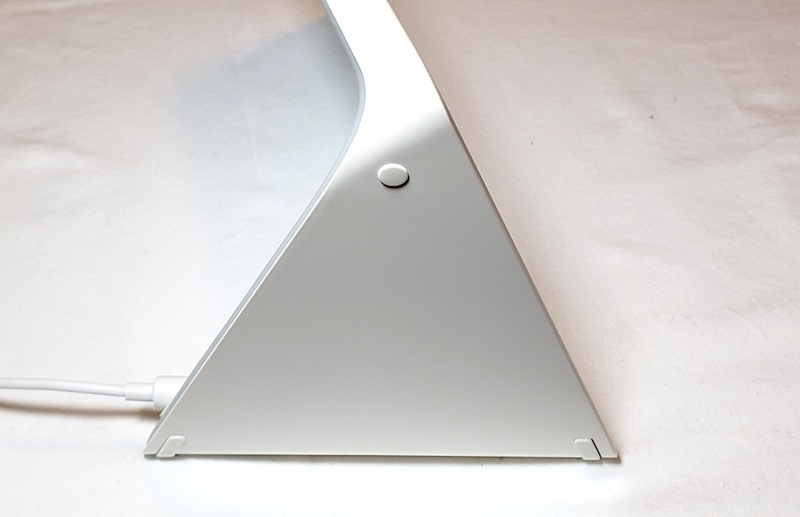 It also has all of the same functionality as the 10″ model and does everything that is mentioned in this review. In fact, I actually like it a little bit better than the 10″ model due to its smaller footprint, meaning it takes up less space on my kitchen counter when I want to use it to follow a recipe. 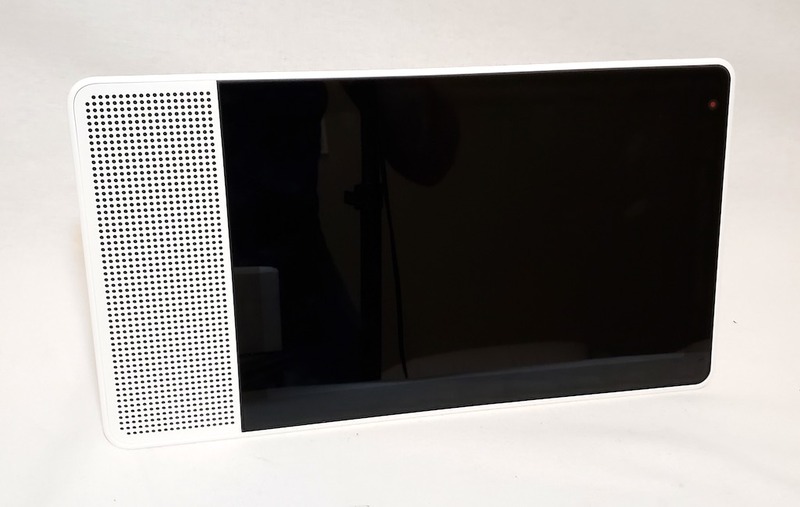 The Lenovo Smart Display takes an already convenient technology (Google Home) and adds in the ability to see text, video, images, and any other visual media or information that one can find on the Internet when asking their Google Home a question. Among its key features are the ability to show you your favourite websites just like any computer or tablet (including text based recipe instructions, YouTube videos for news and entertainment, sports scores and statistics, or photos of anything you wish to find), the ability to answer your questions on virtually any subject, the ability to play your favourite music for you, and the ability to control your other smart home devices (an incredible 1500+ of them) via voice based commands. But that’s not all—you can also engage in video calling (via Google Duo), shop till you drop through your favourite online retailers, set a timer to help you maintain a schedule (i.e., by telling you when something is finished cooking or baking), find you the location of the nearest (you fill in the blank), give you a rundown of your daily agenda, and even stream your favourite TV shows and movies at your own convenience. Of course, these are just a few of the many useful ways that the new Lenovo Smart Display can bring joy and convenience to your life. 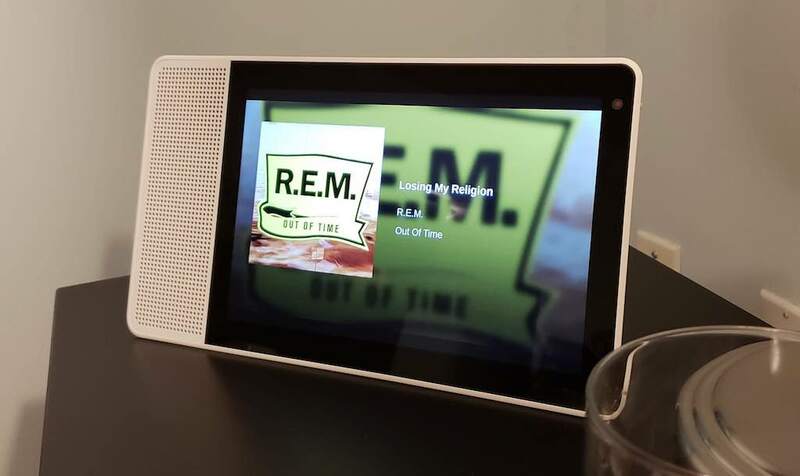 On the specs side of the ledger, the Lenovo Smart Display has a 10.1″ Full HD IPS Display Screen (featuring 1920 x 1200 video resolution), a 2 inch 10 Watt Full Range Speaker (along with 2x Passive Tweeters and support for Multi-room Audio), a Front Facing Camera (offering 5MP of wide angle capture), 2GB of RAM, up to 4GB of (eMMC) Flash, and it runs on the Android things Operating System. The setup process for the Lenovo Smart Display could not have been easier. 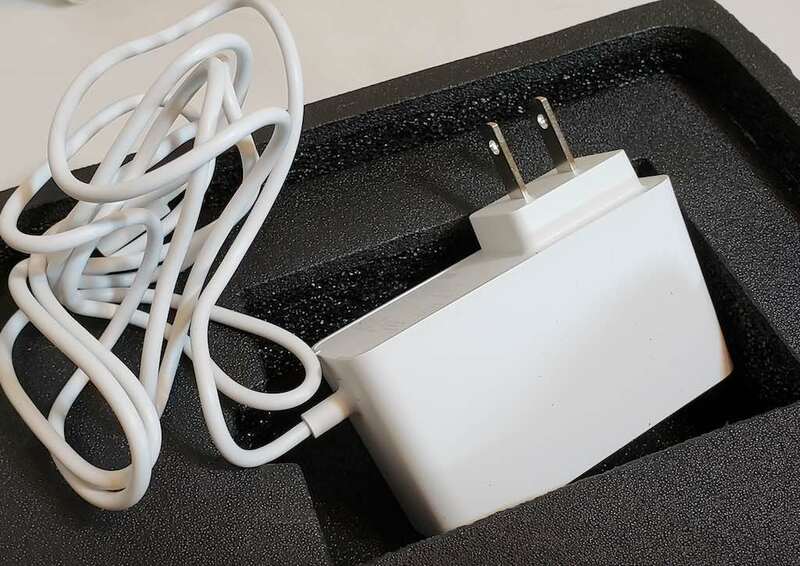 All I had to do was plug it in via the included AC adaptor, download the Google Home App to my existing smart phone (you can also use a tablet), and run through a very brief setup process that entirely ran itself. I mean, literally, I didn’t even have to input the clunky and cumbersome (and mile long) password for my home Wi-Fi setup, which has not been the case when I’ve tested similar devices in the past. I just love avoiding that nasty password! Once setup was complete, I tried a variety of different questions and requests for the device. I asked questions like “Hey Google, what is tomorrow’s weather forecast?” and made requests such as “Hey Google, play me some REM.” In every case, I was not disappointed. Google did exactly what I asked, and it did it immediately and without question. I can’t say that the audio is the best in the world, but it sure is nice to have the music you want to hear all ready to play on command (Google simply found the songs I requested on YouTube and played them for me from there). One issue I did notice was that when my Wi-Fi connection was being heavily taxed (like when I was transferring clips for the video below), sometimes the Smart Display would give me a “Network problem” notification, as it couldn’t establish a connection at those times. This sort of thing doesn’t happen all that often, but it is worth noting. Perhaps if I had kept it closer to my router, there wouldn’t have been any issues at all. 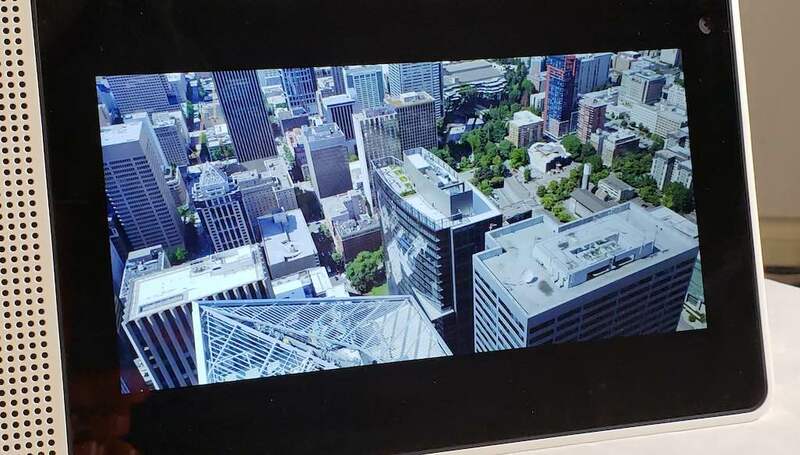 Another thing I noticed (and liked) about the Lenovo Smart Display was its seemingly endless supply of beautiful screen saver art (like the image shown above). The display would constantly cycle through incredible photographs, paintings, and other amazing works of art that would continually catch my eye. The resolution of this thing is also truly impressive, and it made all of the images look super sharp. It was really quite difficult at times to look away from its screen. 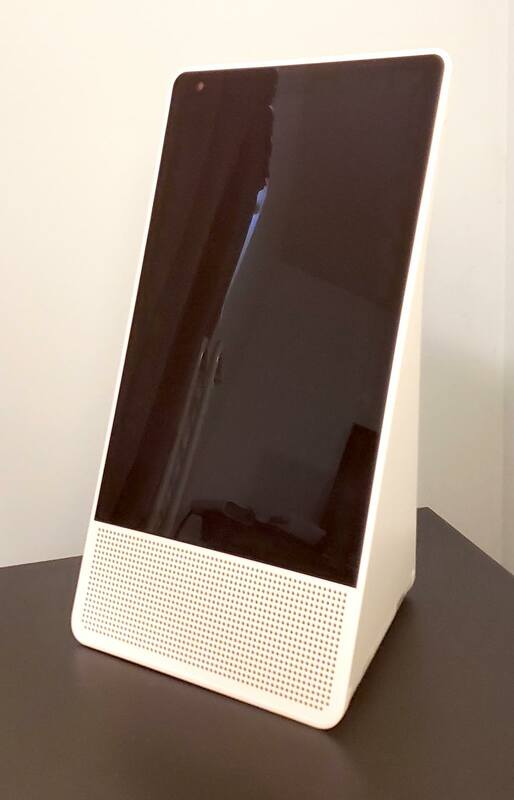 It should also be noted that the Lenovo Smart Display also has a portrait orientation mode, but, at the current time, this mode only supports video calling. Since many of the people I regularly converse with via telephone have not quite yet joined the modern age (myself included, in many ways), I didn’t get a chance to test this feature out for myself. However, I do believe that the portrait mode probably makes the most sense for video calling, and it will be interesting to see if Lenovo decides to expand its use for other apps and purposes as well. It is also worth noting that the Smart Display stands equally well in either orientation and looks very attractive while doing it. One last thing I wanted to mention is that the Lenovo Smart Display makes an excellent digital photo frame. I found this out when I got the chance to test the 8″ version of the product a few weeks after initially testing the larger model. All you have to do is set the permissions on your Google Photos App to allow your pictures to be shared with the display, and then just ask Google to display your photos for you. Say something like “Hey Google, show my photos” and the screen will begin displaying your images in slideshow format, keeping each image on screen for just a few seconds before moving on to the next. It’s really cool, and the image quality is great! 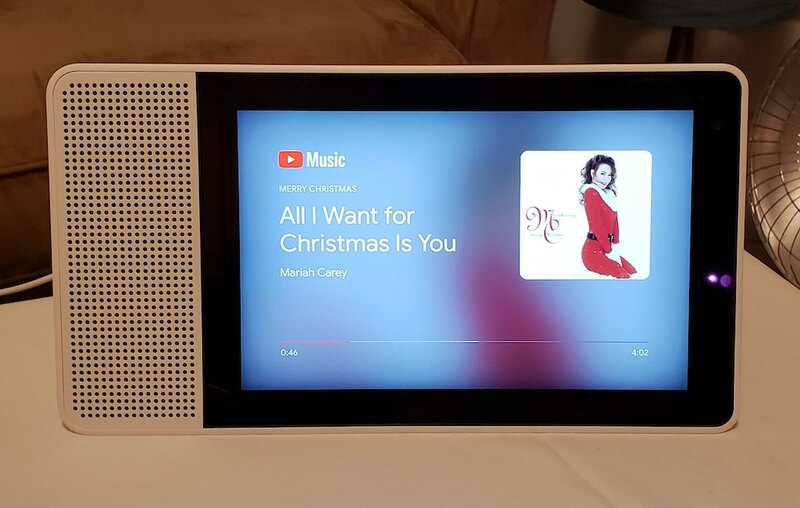 If you’ve been thinking of getting a smart voice assistant anyway and just haven’t gotten around to it yet, you might as well pick up the Lenovo Smart Display as your home’s main voice assistant device since you’ll be getting more than just a standard, audio only voice assistant. With the 10 inch screen to show you videos, images, recipes, and more, it’s much more handy than your typical smart assistant device. I really enjoyed having this thing around, and I found it useful for a variety of different reasons. If I eventually pick up a smart voice assistant for my own home (and I’m getting more and more tempted all the time), it’s got to be one with a built-in display. Great job Lenovo! Bonjour j’ai acheté le Lenovo smart display 8″ et je ne suis pas en mesure de m’en servir en français…est ce normal? Comment le mettre en français? Can this function as a smart digital frame? It can! I think your photos need to be in Google Photos. 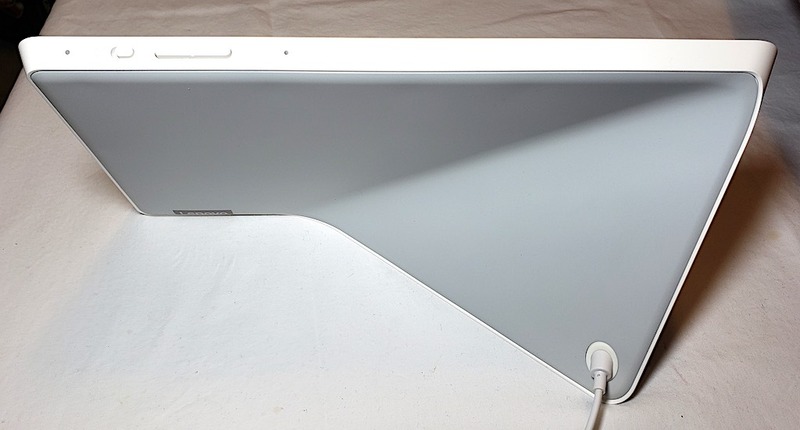 The 10 inch model was provided to us for the review; however, at this time Best Buy is only able to offer the 8″ model in Canada. It has the same functionality, but with a smaller screen; also the back of the 8″ device does not have the bamboo finish.